We had visitors coming for brunch this morning so obviously I decided to make something I’ve never made before without actually following any particular recipe. 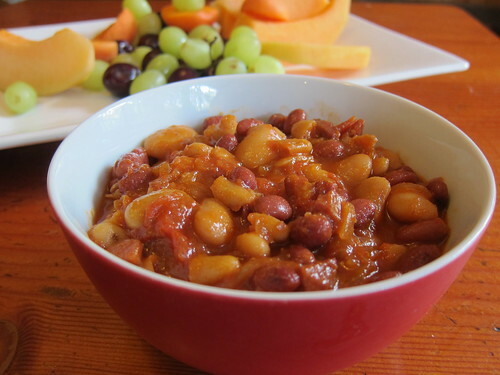 I’ve wanted to make baked beans for years but have never got around to it. I’m going to be doing it lots from now on, because these were really rather good and, once I gave up on the notion of being organised enough to use dried beans, they were also fairly quick. As usual, due to Nanny Ogg cooking methods, the quantities are a bit approximate. Heat oil in a large saucepan and cook ham and onions until onion is soft. Add tomatoes, beef stock, brown sugar, treacle, mustard powder, garlic powder, cayenne pepper and bay leaves, bring to the boil then turn down the heat and simmer while you muck around with the beans. Pour the beans into a colander in the sink and rinse well, allow to drain. Add them to the sauce and stir gently. Simmer for an hour, stirring occasionally (or this is the point at which you could stick them in the oven in order to justify the “baked” bit if you wanted to). We had them with corn fritters and a baby spinach, semi dried tomato and prosciutto salad. So good. Next time I’m going to add some smoked paprika too. And I reckon you could make a pretty good veg*n version by leaving out the ham and adding an extra stock cube to compensate. Oh Mim, that sounds fabulously tasty. What does it feel like to be cooking again? I’m still using kitchen hands for most of it! Adam did all the chopping stuff up and opening tins and so on – I just stirred and tasted and added spices.